We already know that quinoa is good for you. It is a healthy alternative for staple products such as rice and wheat. It has gone beyond the hipster’s salad. In fact, quinoa is going mainstream and food producers have come to realize this as well. Shops and supermarkets carry, besides regular quinoa seeds, quinoa flakes, and quinoa flour, many different products that have quinoa as a main ingredient. In this article, we’ll have a look at new and innovative food and beverages that are made from or made with quinoa. Ever tried quinoa on the rocks? 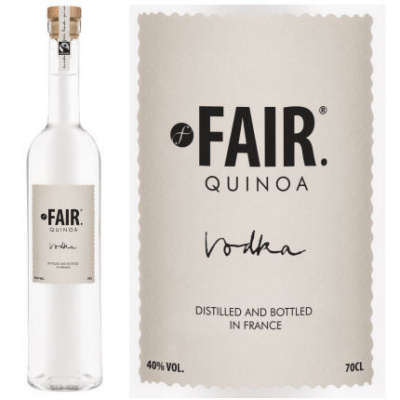 Fair Quinoa Vodka is made from Fair Trade organic quinoa by French distiller Fair. It is the result of a two-year research project between Andean farmers and the spirit and winemaker. 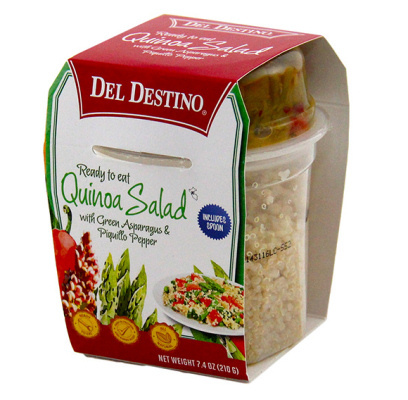 A healthy quinoa lunch straight out of a box. Del Destino offers ready to eat salads such as this delicious looking Quinoa Salad with Mango, Hearts of Palm, and Piquillo Peppers. Made with pre-cooked Peruvian Quinoa. We know Quinoa flour. And know there also is instant quinoa powder. 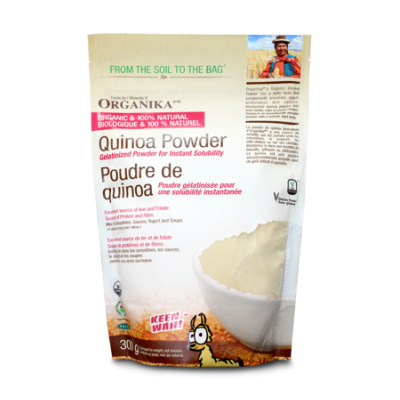 Canadian Organika offers (edit 2018, no longer on sale) organic gelatinized quinoa powder you can add to your meal or create an instant super healthy smoothie. The kids will love it. Applesauce or apple puree with quinoa. 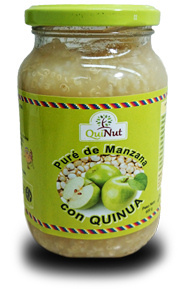 Bolivian Comrural sells a jar full of vitamins, fiber, omega 3 and omega 6. Should be great with pork chops or just as a quick snack in between meals. 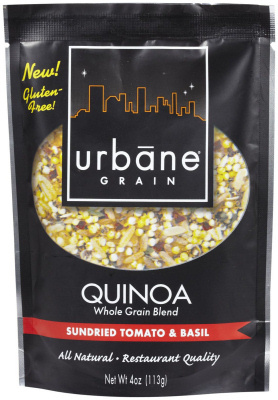 California-based Urbane Grain offers nine all natural innovative side dishes made with Quinoa. How about quinoa flavored with miso, edamame, scallions. Sounds absolutely delicious. Feel like an earthy and nutty flavored whiskey? 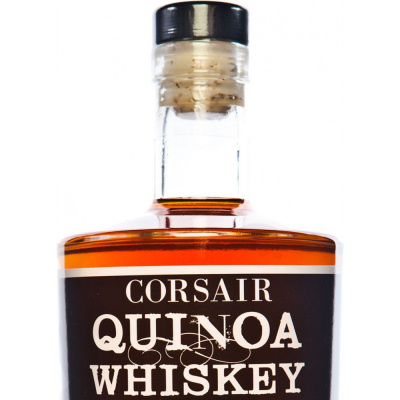 Even though Corsair’s Quinoa Whiskey has been on the market for a while, not a lot of people know about this unusual American whiskey pot distilled from quinoa and malted barley. Cheers! Organic, vegan, gluten-free and light. 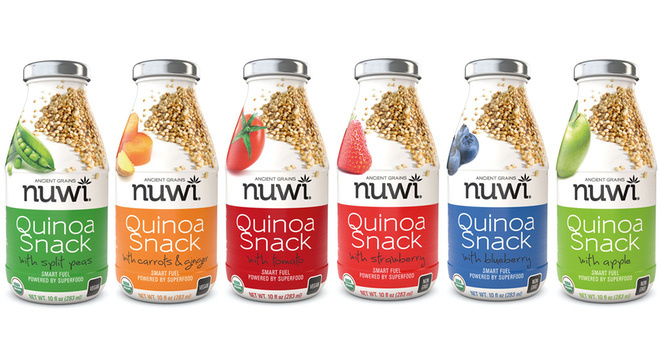 Nuwi’s fruity quinoa drinkable snacks are guilt-free snacks made with organic quinoa flour. Mc Donalds in Germany introduced the ‘Veggie Clubhouse’ as an experiment in 2015. 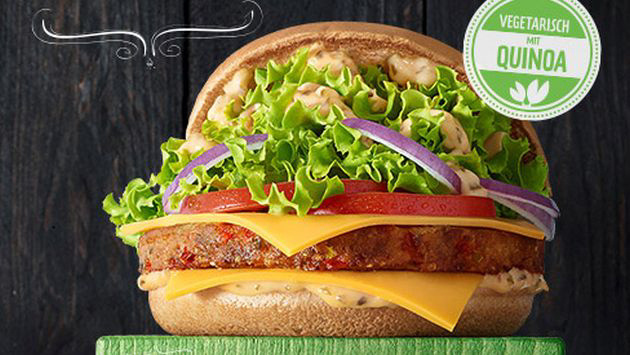 The burger caught on and is now sold at McDonald restaurants nation-wide. 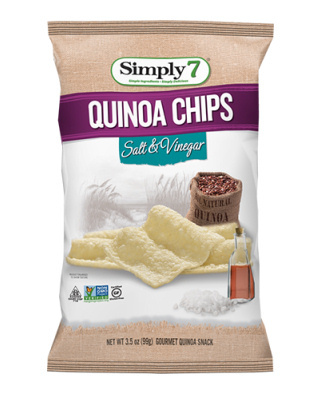 Quinoa is slowly becoming a mainstream product. And for good reason. It is a healthy and tasty grain (actually it is a seed) that can be used is many ways to enrich food and beverages. I am curious when we’ll see quinoa ice cream or a variety of quinoa biscuits in the shops. If you want to learn more about quinoa, I recommend you read OrganicCrop’s Quinoa frequent asked questions (faq).